Newcide is a premium odor counteractant that encapsulates odors immediately upon contact. 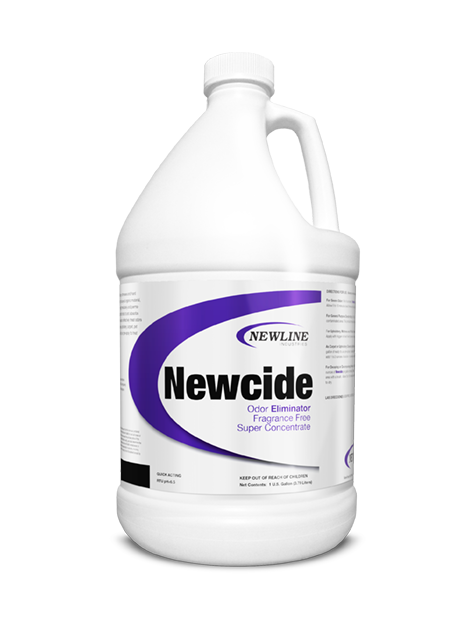 Newcide is odor-free and perfect for encapsulating nasty urine odors on porous and non-porous surfaces. 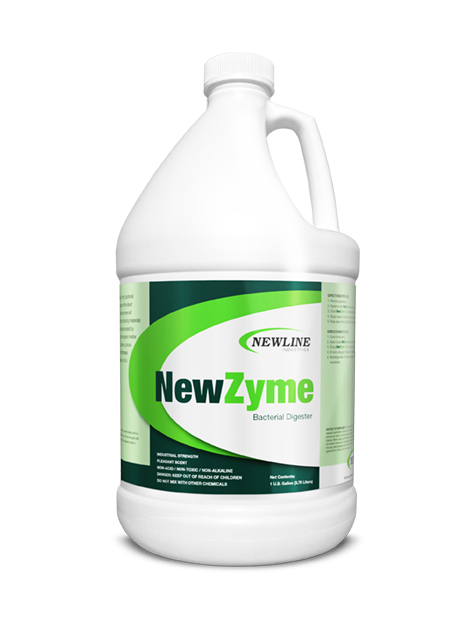 Newcide is not a masking agent as it eliminates odors permanently by attacking the chemical structure of many offensive odors. Newcide is formulated for institutional and commercial use. 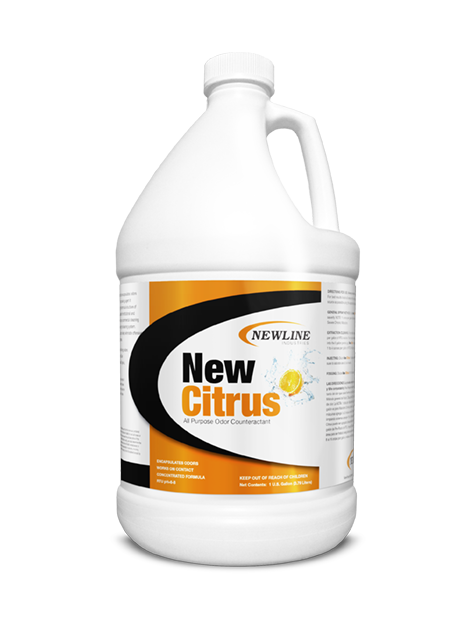 Newcide may be added to any residential or commercial cleaning product to improve air quality thus improving the cleaning system. Newcide can also be ULV fogged, injected and used as a post spray. Newcide is recommended for use on the following odors: (urine, pet, smoke, mildew, bacteria, vomit, skunk, airborne malodor, sewage, trash, organic, sulfide and more). New Spice is recommended for use on the following odors: (urine, pet, smoke, mildew, bacteria, vomit, skunk, airborne malodor, sewage, trash, organic, sulfide and more). New Mellon is a premium odor counteractant that encapsulates odors immediately upon contact. New Mellon is not a masking agent as it eliminates odors permanently by attacking the chemical structure of many offensive odors. New Mellon is formulated for institutional and commercial use. New Mellon may be added to any residential or commercial cleaning product to improve air quality thus improving the cleaning system. New Mellon can also be ULV fogged, injected and used as a post spray. A great fresh scent of cucumber melon! New Mellon is recommended for use on the following odors: (urine, pet, smoke, mildew, bacteria, vomit, skunk, airborne malodor, sewage, trash, organic, sulfide and more). New Linen is a premium odor counteractant that encapsulates odors immediately upon contact. New Linen is not a masking agent as it eliminates odors permanently by attacking the chemical structure of many offensive odors. New Linen is formulated for commercial and institutional use. New Linen may be added to your cleaning products to improve indoor air quality thus improving your cleaning system. New Linen may be ULV fogged, added to your extraction rinse and injected. New Frost is a premium odor counteractant that encapsulates odors immediately upon contact. 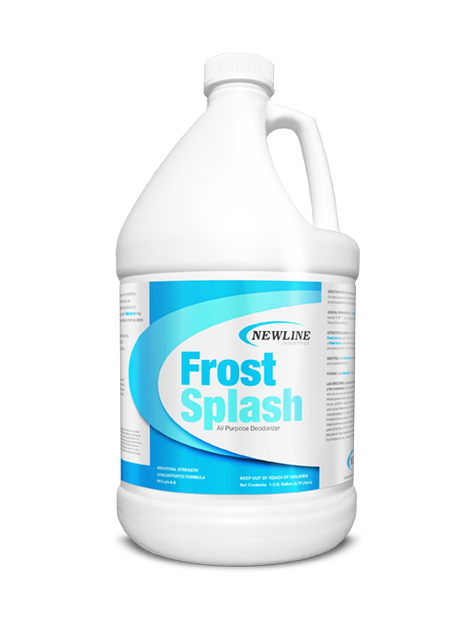 New Frost is not a masking agent as it eliminates odors permanently by attacking the chemical structure of many offensive odors. New Frost is formulated for institutional and commercial use. New Frost may be added to any residential or commercial cleaning product to improve air quality thus improving the cleaning system. New Frost can also be ULV fogged, injected and used as a post spray. New Frost is recommended for use on the following odors: (urine, pet, smoke, mildew, bacteria, vomit, skunk, airborne malodor, sewage, trash, organic, sulfide and more). New Fresh is a premium odor counteractant that encapsulates odors immediately upon contact. New Fresh is not a masking agent as it eliminates odors permanently by attacking the chemical structure of many offensive odors. New Fresh is formulated for institutional and commercial use. New Fresh may be added to any residential or commercial cleaning product to improve air quality thus improving the cleaning system. New Fresh can also be ULV fogged, injected and used as a post spray. New Fresh is recommended for use on the following odors: (urine, pet, smoke, mildew, bacteria, vomit, skunk, airborne malodor, sewage, trash, organic, sulfide and more). 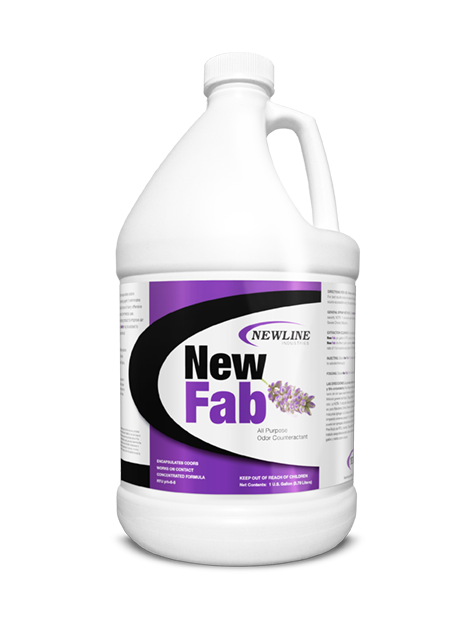 New Fab is a premium odor counteractant that encapsulates odors immediately upon contact with a Lavender fragerance. New Fab is not a masking agent as it eliminates odors permanently by attacking the chemical structure of many offensive odors. New Fab is formulated for institutional and commercial use. New Fab may be added to any residential or commercial cleaning product to improve air quality thus improving the cleaning system. New Fab can also be ULV fogged, injected and used as a post spray. New Fab is recommended for use on the following odors: (urine, pet, smoke, mildew, bacteria, vomit, skunk, airborne malodor, sewage, trash, organic, sulfide and more). Frost Splash provides you a cool crisp fresh scent. This product can be used as a post spray deodorizer on residential jobs. Also great for automobile detailers. This is a great additive to your residential carpet pre-spray. Linen Splash provides you the unique fresh clean linen aroma that homeowners enjoy and associates with cleanliness. 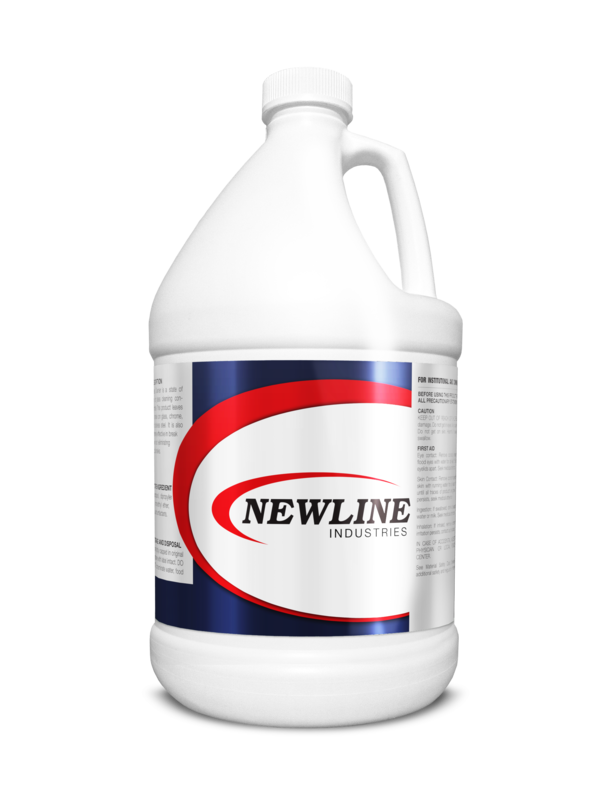 This product is perfect for standard post spray deodorizing or as a additive to your cleaning process. Who doen’t like the smell of fresh clean laundry! Fresh Splash is a unique blend of fresh and clean fragrances that leave a room smelling clean and new. Use this product as a post spray deodorizer or as a additive to your cleaning process. Great for restrooms and commercial buildings. Mellon Splash is a premium deodorizer that goes to work immediately. Mellon Splash is formulated for institutional and commercial use. Mellon Splash may be added to any commercial cleaning product to improve air quality thus improving the cleaning system. Mellon Splash may be added to cleaning solutions to help eliminate offensive chemical odors caused by the cleaning process. Citrus Splash has a unique fragarence that leaves any room smelling clean and fresh like no other citrus product on the market. This product is perfect for standard deodorizing or as an additive to your cleaning process. Citrus Splash is a great odor counteractant to protein fire odors. Peach Solv has a unique fragrance that leaves any room smelling clean and amazing unlike no other product on the market. This product is perfect for standard deodorizing or for apartment cleaning due to its long lasting performance. Lemon Solv has a very unique fragrance that leaves any room smelling clean and amazing unlike no other product on the market. This product is perfect for standard deodorizing or for apartment cleaning due to its long lasting performance. Cherry Solv has a very unique fragrance that leaves any room smelling clean and amazing unlike no other product on the market. This product is perfect for standard deodorizing or for apartment cleaning due to its long lasting performance. Anyone who loves the smell of fresh cherries will love this product! Cinna Solv cinnamon solvent deodorizer leaves any room smelling clean and amazing unlike no other product on the market. This product is perfect for standard deodorizing or for apartment cleaning due to its long lasting performance. Anyone who loves the smell of ground cinnamon will love this product!